At North East Mobility Solutions our customers come back time and time again. They say it’s because we look after them. 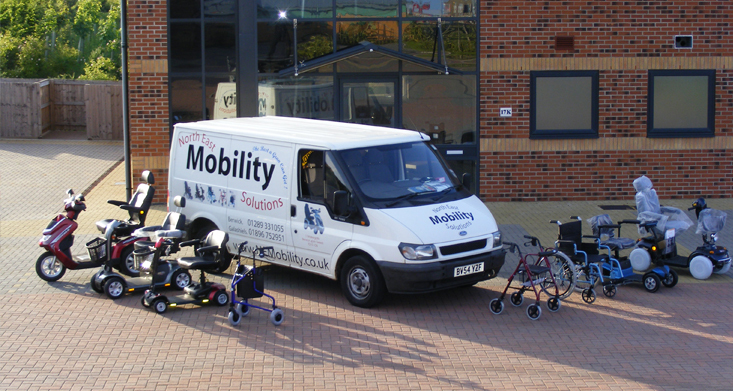 You can access knowledge and expertise in the mobility solutions arena to help you choose the right mobility aids, mobility scooter, wheelchair or stair lift for you, either for purchase or hire. As specialists in Stair Lifts, we'll talk you through the options to suit you and your home. Getting the right product for you, and within your budget, is our number one priority. Especially popular with carers of the elderly, ill or disabled, our advice, support and after-sales care comes as standard. Place your order online for quick delivery, or use our mobility shops in Berwick-upon-Tweed and Galashiels, if you’re in the Northumberland or Scottish Borders area. If you need any help with making your choice give us a call on 08432 903317, sign up to receive our newsletter. You can also follow us on Twitter or Facebook. "Recently I needed a repair. They acted quickly and returned the scooter to me in the shortest time possible." "I was extremely impressed by the courtesy and service I received from Donald and Mikey." "Donald and Mike have a fair and ethical business policy (very rare these days). They are friendly, efficient, reliable and helpful. North East Mobility Solutions well deserves to survive these hard times and to prosper." Latest news 'We now have the TGA Whill 'Next Generation' Powerchair in stock for demonstrations. We also have some exciting specialist 4 Wheel Drive extreme off road electric Wheelchairs and mobility scooters with extreme off road capabilities. Curved Stairlifts - Click the button on the left or Call 01289 331 055 for a FREE no obligation quotation North East Mobility Solutions' curved stairlifts offer a safe and reliable solution to overcoming the problems posed by going up and down stairs at home. We use a range of stairlifts from different manufacturers enabling us to get you the very best design to suit your staircase, including: Handicare Minivator Freelift Acorn Bison Brooks These are renowned for reliability, practicality and most importantly value for money. Even if the staircase has bends and corners in it, our engineers can choose the right manufacturer and model stairlift that will suit your staircase perfectly. Our stairlifts offer all the basic functions you would expect plus options to upgrade, powered seat swivel and / or powered footplate If you have an obstruction at the base of the stairs, like a doorway etc you can choose from a automatic folding hinged track or simply Freelifts tight-fitting drop nose rail which only requires 250mm of wall length at the bottom of the stairs. Curved Stairlift InstallationInstallation is a quick and easy process which in many cases will only take 3-4 hours and leave little to no mess letting you get on with the rest of your day and enjoy your new stairlift. The track is fitted to the stairs, not the wall, so it is very unlikely you will need to redecorate following the installation of your stairlift. All our stairlifts have battery backup which means they will continue to work in the event of a power cut so you do not need to worry about being stranded up or down the stairs. The compact seat unit on our stairlifts, fold up leaving the staircase free for other users and also, the stairlift is supplied with two remote controls which means, once folded, you can move it along the track freeing up space in your hallway. Very easy to use and packed with safety features, all our stairlifts really are a step in the right direction. We have trained stairlift specialists based in Berwick-Upon-Tweed covering the whole of Northumberland, also stairlift engineers in Galashiels covering all stairlift enquiries throughout the Scottish Borders and Southern Scotland and we also have Stairlift fitters in Greater Manchester installing and repairing Stairlifts throughout England and Wales. HANDICARE, BROOKS, BISON, MINIVATOR, FREELIFT, ACORN Click the button on the left for a free 'no obligation quotation' and a member of our stairlift team will contact you shortly. The Mobie Mobility Scooter - Portable Mobility Scooter FREE MOBIE TRANSPORTATION BAG WITH ANY MOBIE OR MOBIE PACKAGE!!!! North East Mobility Solutions are delighted to introduce the Mobie - Folding Mobility Scooter. The Mobie Portable Mobility Scooter can transform from a small suitcase sized product to a full size ready to use mobility scooter in less than 5 SECONDS!!! The Mobie mobility scooter is designed with total flexbility in mind. Its compact size and small turning circle make it amazingly usable indoors. When venturing outside on the Mobie Portable Boot Scooter its quick manoeuvrability, flexible chassis and its higher than average seat height will make you feel totally safe and in control. Steep hills and inclines are NO problem to the Mobie, it has a 200 watt motor providing all the power you should ever need. The Mobie also has a compartment for carrying a spare battery so you will be able to travel twice the distance if required. The Mobie's retro looks and stylish design is a real eye catcher, not to mention its transform credentials. With a choice of colours and its take anywhere design philosophy the Mobie Mobility Scooter truly is an amazing peice of design and engineering!! The Mobie Mobility Scooter is lightweight at only 22.8kg. (easy 2 person lift into car boot) Ideal for taking on buses, trains, airplanes, cars and cruises. Your ideal travel companion. MAX SPEED 4 mph MOTOR 200 watt OVERALL LENGTH (unfolded) 99cm OVERALL LENGTH (folded) 43cm WIDTH 43cm BATTERY REQ / RANGE Lithium / upto 10miles MAX WEIGHT CAPACITY 114kg / 18st SEAT HEIGHT 65cm WEIGHT 22.8kg Choose from 3 options (all include FREE BAG!!) The Mobie - Standard Scooter & charger The Mobie With Arm Rests Complete Mobie Package - Mobie Mobility Scooter, Arm Rests, Off board charger and Spare Battery offering a range upto 20miles. North East Mobility Solutions will only deliver mobility scooters ourselves. We will never send a mobility scooter out by courier. We will only send one of our fully trained engineers, ensuring you recieve a demonstration and advise on using the product safely. This will ensure you get the correct product for your needs and improves user safety and awareness. Supplying the Mobie Mobility Scooter throughout North East England, Scotland and Nationwide.